Templates to print on fabric or paper for the Feathered Star quilts. Print hundreds of shapes on fabric (or on paper for templates) in a few minutes and sew Feathered Star by hand or by machine! VIDEO below! 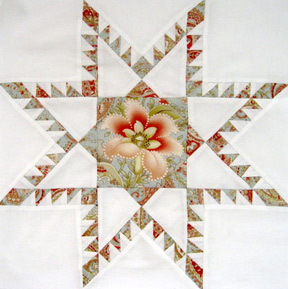 Feathered Star is one of the designs most requested by Inklingo quilters. They recognize that having the cutting lines, stitching lines, matching marks, and crosshairs printed on the fabric is the simplest and best way to make complicated designs. The Feathered Star Design Book (half price or free) will help you sew these wonderful blocks, whether you are following a traditional pattern or creating your own design. It is an amazing resource for professional pattern designers too. If you buy the design book first ($10), the payment is credited when you buy the shapes (details). See why quilters love Inklingo for Feathered Star. There is a new article about Feathered Star Quilts on Quilting Hub. Print triangles on one fabric, layer with unprinted fabric, stitch, and cut. No tricky bias to manage! The pressing guides will give you confidence and improve your accuracy. In addition to several different shapes for centers you can use any other 4.5, 6.0, or 9.0 inch block! This PDF (85 pages) includes everything you need to know to design and sew your Feathered Stars. Don't miss the 80-second video! Traditional Feathered Star blocks often finish with odd sizes like 27.5 inches, 21.75 inches, or 18.5 inches, because designers draft the feathers first to make the small feather triangles easy to measure. This makes sense because there are so many feathers compared to the other shapes, but it is different from the normal approach of drafting for a specific finished block size. The strange sizes are not a problem when Feathered Star blocks are set together, or when they serve as a medallion for a larger quilt. Since Inklingo quilters do not have to measure the feathers to cut them, Inklingo makes a great new approach possible. Use any 4.5, 6, or 9 inch block! My objective is to allow quilters to use any standard blocks in the center (e.g. 4.5 inch, 6 inch, 9 inch) to give maximum design flexibility (red box above). The 15 inch Feathered Star is compatible with the shapes in the free collection too! "I love this pattern and the way it went together with such ease, like a dream. I would never have attempted this had it not been for Inklingo." The preparation is faster and more precise. You have a choice of layouts to use fabric efficiently. You have a line to sew along. You have detailed pressing diagrams and a unique pressing guide! You might be surprised that making one can be condensed into 80 seconds. That's seconds, not minutes. The printing, cutting, sewing and pressing whiz past very quickly in the video, but don't worry! The Feathered Star Design Book includes detailed instructions for designing, sewing, and pressing your Feathered Star Quilt and it is free when you buy the shapes to print on fabric ($20 value). There are also photos of Feathered Star quilts and articles on the All About Inklingo blog.